My oh my, – pass the napkins, please! I’ve eaten a lot of corn in my day, but never have I ever before savored such a decked-out, delicious ear. My friend and fellow food lover, Pat Shure — a retired University of Michigan math department lecturer — sent me the recipe. How could I pass this up, especially with Michigan corn so inexpensive and plentiful. Pat first feasted on the corn while having lunch with her son, Jason, at Cafe Habana in Nolita (north of Little Italy), in New York City. “It’s a couple of blocks from where Jason works and we always chose it for lunch. It’s tiny and hectic with the requisite number of models in big sunglasses hanging around outside waiting for a table,” says Pat. Returning to Ann Arbor, she made her own version of Mexican Street Corn, which she shared with the rest of us. I’d advise removing your oversized sunglasses when feasting on this deliciously blinged-out corn; there’s not enough space on your face. Recipe compliments of Pat Shure; I took the liberty of adding cayenne — I’ll bet cilantro would be delicious sprinkled over the corn, if desired. I garnished the platter with edible nasturtium blossoms. 1 cup freshly grated Cotija cheese* (about 5 ounces) best grated with microplane. Preheat gas or charcoal grill to medium-high heat; grill grates should be cleaned and oiled. 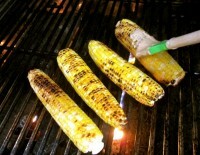 Grill corn, turning frequently, until kernels are speckled golden brown; 20-30 minutes depending on heat of flame. 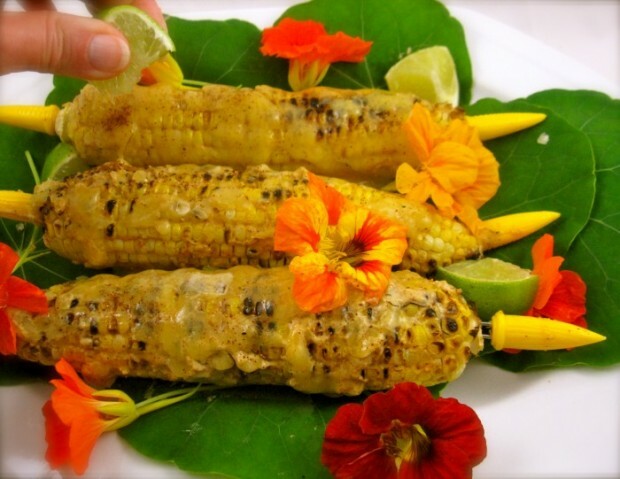 While corn is grilling, in a small bowl, combine mayonnaise, sour cream, chili powder and lime juice. Season to taste with kosher salt and cayenne, if desired. Place grated cheese on a large plate and set aside. When corn is cooked, attach corn holders to each ear, then – working quickly — paint each ear with the mayonnaise mixture (this is the glue for the cheese). Immediately roll each ear in the grated cheese; you are working quickly because you want the heat of the corn to soften the cheese. Sprinkle with additional chili powder and serve. *Cheese available at Whole Foods; I’d imagine a queso quesidilla-style cheese could be substituted.